I am so excited to share with you my recent purchase, The Hourglass Ambient Lighting Blush in Mood Exposure. This groundbreaking hybrid combines the customized lighting effects of Ambient Lighting Powder with a spectrum of breathtakingly modern hues. The result is a natural radiant finish with seamless, soft-focus buildable colour. Unlike traditional blush, which tends to be flat, Ambient Lighting blush uses Photo luminescent Technology to exhibit depth and dimension. The airy, light weight powders contain optically transparent particles that amplify the colours to a multi dimensional level- effectively reinventing the way you blush. The handmade powders are formulated using an advanced miscelare technique- which means 'to mix' in Italian- creating the perfect balance of pigment and powder, and no two look alike. Mood exposure is a soft plum fused with Mood light to brighten the complexion. I absolutely love the colour. When I saw the blushes at Mecca and swatched them, all the others felt very dupable colour wise and I was left with Radiant Magenta and Mood Exposure. I have a lot of pinks and corals in my blush collection so Mood Exposure was a definite pick. It is a beautiful plum rose shade that looks absolutely gorgeous when applied on the cheeks. It has a slight sheen to it but no glitter or shimmer. It appears light on the swatch but when applied to the cheek it blends in with your skin and provides a very natural flush of colour. I adore this blush mainly because of the colour. The packaging is a gorgeous gold case with a good size mirror. With these blushes you need to be very careful as they break very easily. The texture is soft and finely milled. These blushes are also fragrance, paraben, talc and gluten free. These blushes are now available at Mecca Cosmetica and Mecca Maxima for $50 each. 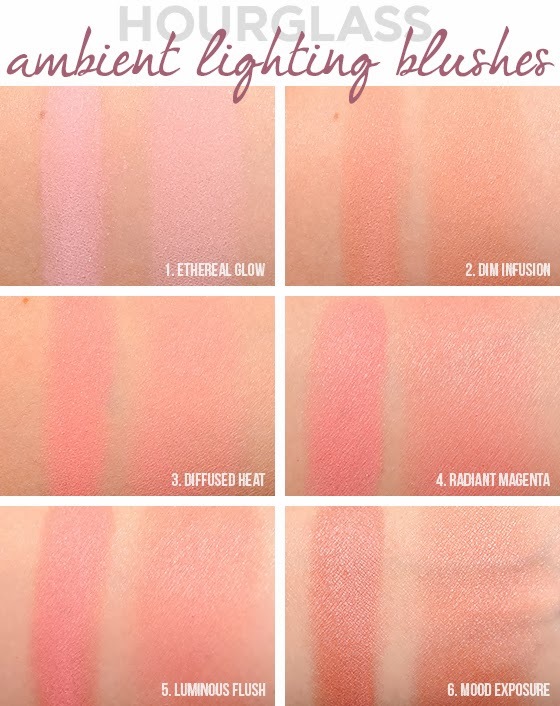 The picture below shows all the different blushes swatches from Temptalia. Have you picked up any of the Ambient Lighting blushes yet? If yes, which shade? I can't get over how gorgeous this is!! Stunning. I just read your post. Such a fun tag.